Spicy Italian! Here’s Old World quality in a zesty blend of pepperoni and salami slices, topped with cheese, if you please! Oil and vinegar on that, with some hot peppers? We’ll garnish it the way you say – and fresh toasting all the way through adds the crowning touch! Steak & Cheese! The juicy SUBWAY® “Steak & Cheese” sub features tender cuts of seared, diced steak, enhanced with fire-roasted and grilled sweet bell peppers and onions, topped off with cheese, then “fresh Toasted”™ to draw out its full flavor and texture. Subway Melt! 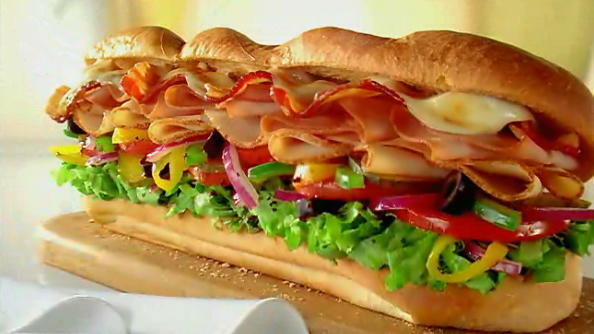 If a picture is worth a thousand words, what do you picture when you hear the words SUBWAY® Melt? How about lean and tender sliced turkey, ham and crispy bacon topped with melted cheese and served hot with your choice of fresh vegetables and condiments on freshly baked bread. Mmm. Chicken & Bacon Ranch! The fresh toasted SUBWAY® Chicken & Bacon Ranch sub is made with melted Monterey Cheddar cheese, all-white meat chicken breast strips, bacon strips, lettuce, tomato wheels, onions, green pepper strips, black olive slices, and ranch dressing. Where available, other cheeses may be substituted at the customer's request. Wow! Specially made and oh-so-beautiful to see and serve, these subs feature freshly-baked, braided breads, filled with your choice of cold deli meats or seafood, sliced cheeses, and all the veggies – available in lengths from one foot to one hundred, each one foot portion typically satisfying 3-4 guests. What could be more welcome by your family and guests? 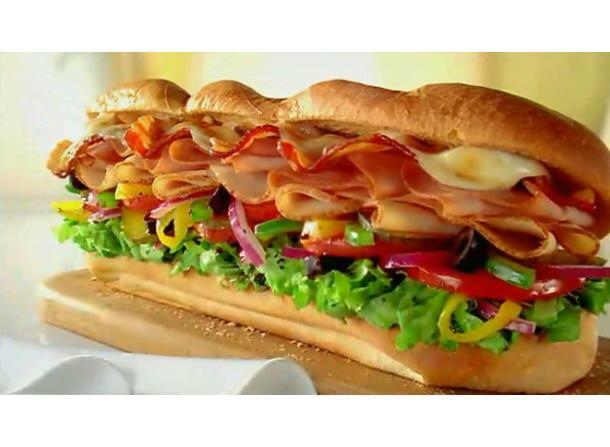 World famous, fresh SUBWAY® subs – featuring your choice of cold meats and seafood on gourmet-inspired breads - cut into handy 4-inch portions and arranged on serving platters, ready to be enjoyed! How convenient – and delicious! We’ll enrobe your selection of cold SUBWAY® menu favorites into a soft flour wrap, dressed with the cheese, garden veggies and toppings you choose, then place them on a party platter, ready to serve with pride! Such sweet temptations – including sugar cookies, white chocolate with macadamia nuts, oatmeal raisin, chocolate chip – all bursting with just-baked goodness! Three dozen cookies are on each platter - just let your SUBWAY® Sandwich Artist® know the flavors you crave.